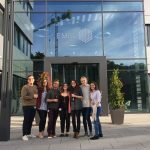 Following on from Rachel’s blog about a day in the life of the internship, I’m going to talk about the construction of the LBA and the end of the project. With the construction of the HBA completed, it was time for us to move on to our next task. This was the construction of the second part of the telescope; the LBA, which detects radio waves of a lower frequency than the HBA. The LBA perhaps seems a little stranger than the HBA, as instead of comprising of straightforward rows and columns of antennae, the LBA consists of antennae which are seemingly randomly placed around the LBA field. Some of the grids for the antennae even overlap! There’s no apparent structure or order to where each antenna is placed. Another obvious difference is the lack of polystyrene, which after hearing countless claims from the other students about dreaming of polystyrene, was probably a good thing. Construction of the LBA was a less arduous task than the construction of the HBA. The LBA tiles were constructed out on the field, so we said goodbye to our large tent in which the HBA tiles were created. 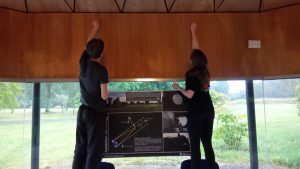 This took away our main source of shelter whenever it rained, but we survived by retreating to the nearby Rosse observatory instead, outside which a gazebo could be put up. The LBA consists of 96 LBA tiles, each made up of a number of components. There’s the metal grid, which acts as a radio wave mirror, on top of which stands a hollow vertical pole, through which the cables previously laid in the ground rise up. On top of this pole is a pre-amplifier to which the cables connect, and from which the active element which actually detects the radio waves comes out. This active element consists of 4 insulated wires which each stretch halfway from the pre-amplifier at the top of the tile to one of the four corners of the metal grid. 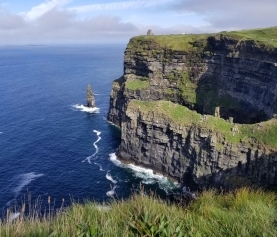 The bottom half of each length is made up of string for two corners and stretchable rubber for the other two, which give the pole a small amount of give to move in extreme weather conditions without the components snapping. 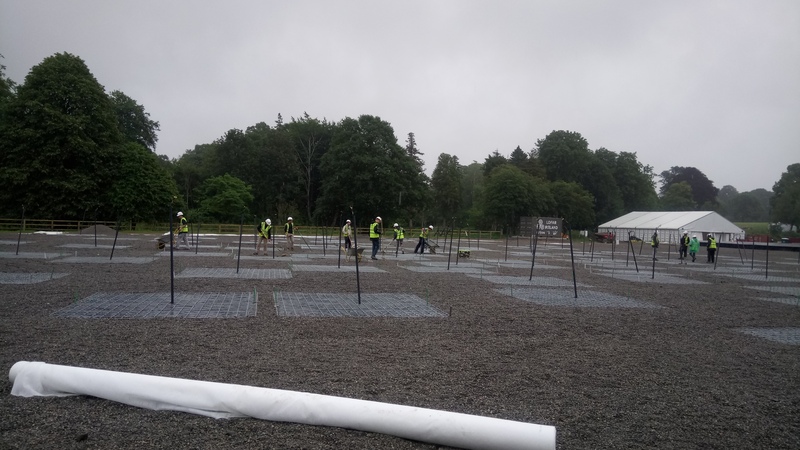 In order to stop plants and weeds growing on the field, plastic sheets were placed under each metal grid, and in the spaces between the tiles, geotextile material was laid down. On top of the geotextile material, gravel was placed. Of all the jobs that were done during the 10 weeks, gravelling was one of the toughest. Piles of gravel were dumped on the field by the builders using their transporters, and it was left to us to disperse the gravel across the field using wheelbarrows, shovels and rakes. Not exactly the type of job you might expect you’d be doing when applying for an internship to build a radio telescope, but it needed to be done! As the telescope was more or less finished by the time we were laying out all the gravel, it became a bit of a running joke that we’d be put out to do some gravelling just to give us something to do if there were no other obvious jobs to be done. Nonetheless, we did it to the best of our abilities and the LBA field looked well by the end. 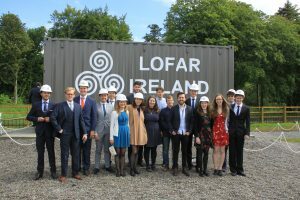 Dr. Peter Gallagher, the man in charge of the project, said that he thought it was the best looking LOFAR telescope of them all, and although this could be akin to a parent thinking their child is the prettiest or handsomest in their class, he could be right. 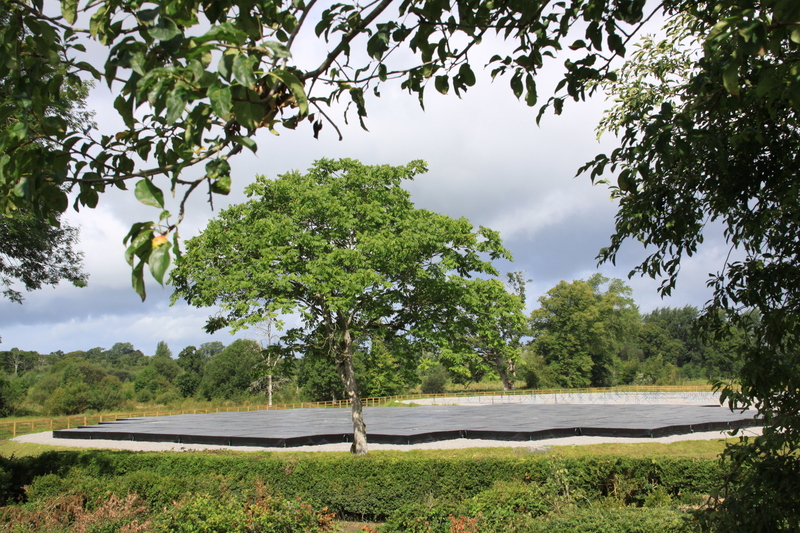 A fun thing we did as the end of the project neared is set up an exhibition on I-LOFAR in a pavilion on the grounds of Birr Castle. Some of the more artistically inclined interns assisted in designing posters for the exhibition and others (including me) helped to set up the exhibition itself. 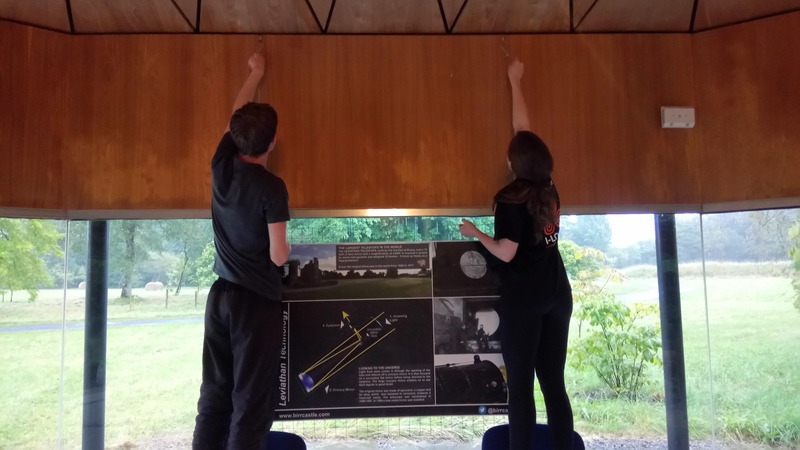 We tried to reflect the look of the telescope in the design of the exhibition, using wire grids to place posters on, which hung from the wall on thick metal wires. The practicalities of actually setting up the exhibition and getting the posters hanging proved more difficult than expected but we managed it eventually after several trips to the local hardware shop Fayles. 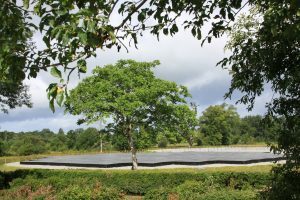 It was a nice feature to have for people visiting the castle to allow them to learn about I-LOFAR and the history of astronomy that the castle has. The official turning on of the telescope took place on July 27th, right at the end of the internship. Minister John Halligan attended along with the CEO of Eir, who sponsored the telescope, Lord Rosse, who is the owner of Birr Castle, and many other important people. The event was even featured on the news, where Rachel could be seen front and centre in the crowd with me briefly seen in the background. During the opening ceremony it started pouring rain, so it was a good thing we had stayed on site late the night before to put up a giant tent! 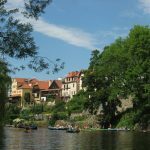 (In fact we had put the tent together during the first week of the project in a different location. 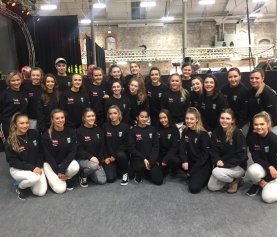 Moving it from the original location to the site of the opening ceremony in more or less one piece was entertaining to say the least) Following this we were invited into Birr Castle by Lord and Lady Rosse. There we were shown a 6 minute preview of the RTE documentary that’s being made about the telescope, which is due to air this year. We were all very impressed by this, and found it funny seeing the timelapse of the construction site included, with all of us scampering like hi-vis ants around the site. Later in the day, we had dinner in Dooly’s Hotel, where we were joined by George Miley, an Irish physicist who wrote the original paper putting forward the idea of LOFAR! 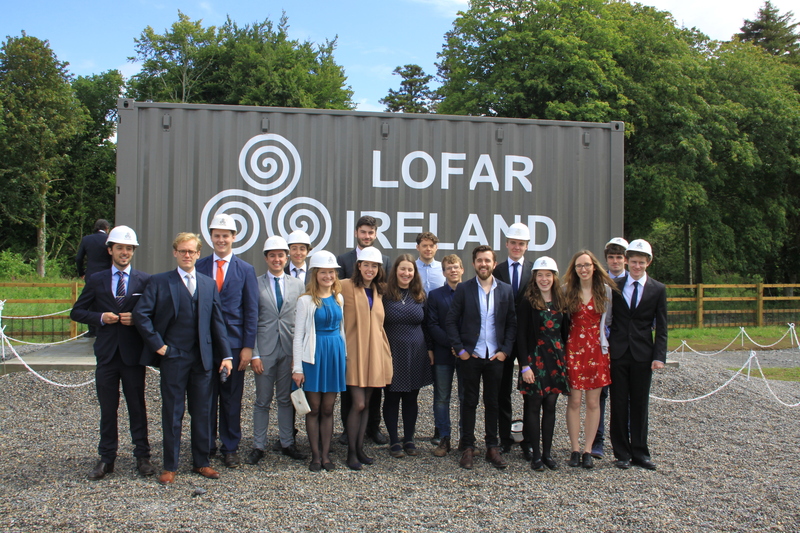 It was great to have him present on the day of the Irish LOFAR station officially opening. We finished off the night with some joke prizes being given out to the build team, by the build team. Many running jokes were referenced. It felt quite strange leaving Birr once everything was finished. I had grown very used to travelling down to Birr on Sunday evenings and living in the house with all the other students. When I visited the site afterwards with my family it felt weird to be on the site but to not have to be doing work. I felt like I still had a duty to be working on something to help to get the site prepared. Overall it was a great experience, and one I’ll definitely remember in years to come. It’s not every day you get to help to construct a giant telescope! Read the first three parts of our I-LOFAR blogs at www.myucdblog.com/tag/i-lofar/.